Abu Bakr al-Baghdadi, the leader of the Islamic State and self-proclaimed caliph, claims to be a descendant of Muhammad. That’s not surprising since most Sunni Muslims believe only a descendant from Muhammad’s tribe can be caliph. 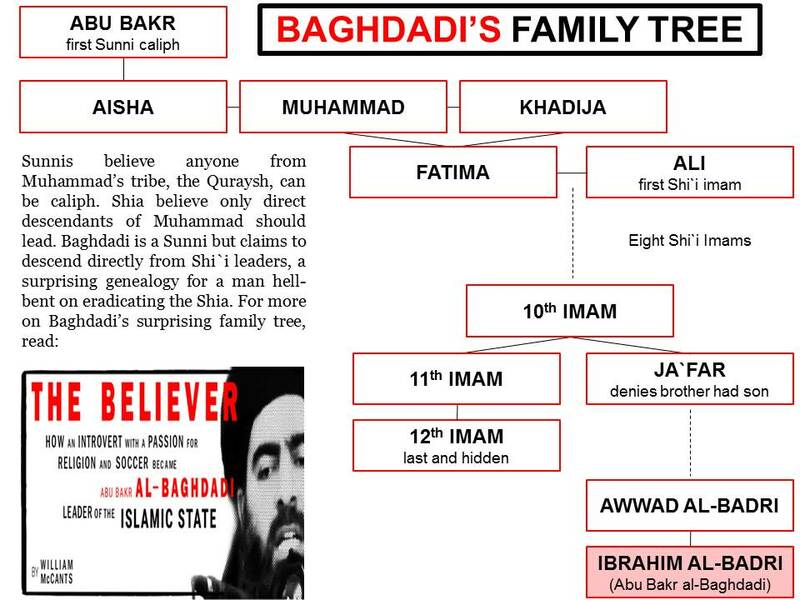 What makes Baghdadi’s lineage interesting is that he claims to descend from Muhammad through ten of the twelve Shi`i imams. That’s an unusual and sadly ironic genealogy for a man hellbent on eradicating the Shia. I mention Baghdadi’s genealogy in passing in my profile of him but you can read a fuller discussion of it in my forthcoming book, ISIS Apocalypse. There you’ll learn about the apocalyptic prophecies that his pedigree supposedly fulfills. You should know that sunnis do not consider these imams to be shia… they consider they were pious sunni muslims.